It's been a while since I last created a wishlist but whilst browsing for future home goodies the other day I came across the prettiest collections I've ever seen from Cath Kidston. Just FYI - not an ad! I'm genuinely in love with this and am seriously considering investing in a couple of these pieces. Today I thought it would be nice to get back into my old school 'Wishlist Wednesdays' and share my favourites from the collection. Apart from being absolutely adorable, this collection is quite elegant and versatile to suit your style. 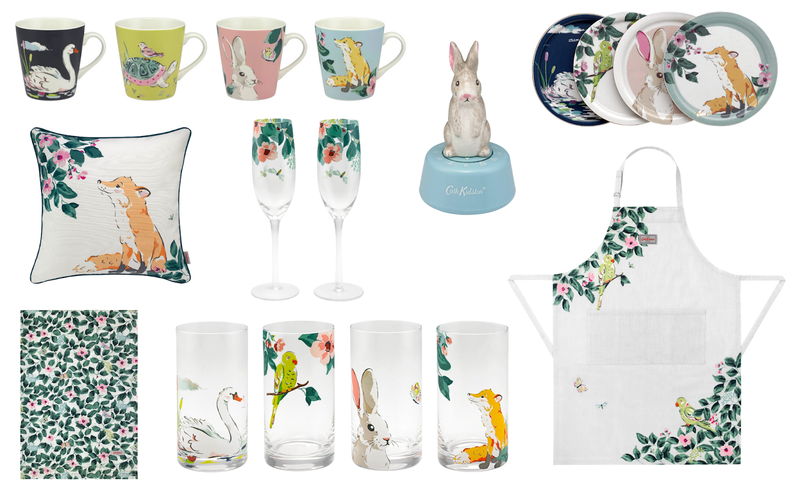 I absolutely adore the animal illustrations and would love to add a couple of investment pieces from Cath Kidston into my soon-to-be new home. I'm particularly keen on getting the table runner and the cushion for the front room. I keep imagining a wooden table with just the runner on and I can imagine a comfy grey sofa with a couple of really simple cushions and then one or two like the fox one. I've been pretty into collecting up my kitchen ware over the last month or so and I've even bought our first kettle and toaster set that I can't wait to set up. A little corner of my room is slowly growing and soon I won't have space for it all! I'd really love this parakeet apron and know I'd use it all the time. I know aprons aren't really much of a thing anymore but I'd definitely like having one to hand because I'm a little bit of a messy cook. At the moment, I've been actively looking for a really good set of mugs so that John and I can have matching mugs for when people come over. And if I had matching coasters I don't think I could contain my excitement to point it out. These ones have definitely caught my eye and even though they're a bit bright I think they'd make a great addition into our future kitchen. I love Cath Kidston and wish I had just a little more cash to spend in there sometimes. I adore their collections and I love their style of illustration. It's absolutely gorgeous and I love how true they stay to their signature style and aesthetic. The prints may often change but the designs and materials don't often. I like that. What's your favourite collection by Cath Kidston at the moment?